Navigation: Home » Offbeat » How Much Lying Do You Expect… or Do… Online? How Much Lying Do You Expect… or Do… Online? Hey, internet. I’m 6’0″ tall. When You’re Online, You Can Expect Lying… But Where? Okay, that’s a lie. Your author is 5’10” tall when measured with a tape measure at roughly midday when standing on a tile floor in thin cotton socks. But… let me back up and approach this from a further distance. Last week, my co-writer Cameron was in town to attend my one year old daughter’s birthday. (While we were drinking) He mentioned to me that he thought I was “stat frauding” by reporting my height as 5’10″… and felt I was rounding up a measure in the mid-to-upper 5’9″ range. And, in a way, we’re both right – vertebral compression alone can make heights vary up to an inch a day (and 3 inches for astronauts on extended missions!). Tack on compression of the arches in your feet and shifting posture and variations in the strength and activity of your core muscles, and your height is a lot more fluid than the statistics on your license tends to suggest. 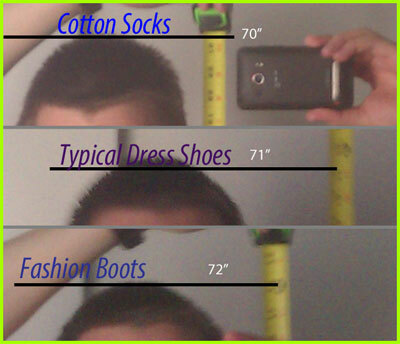 Okay, so you agree – my height is 5’10” +/- 0.5″ depending on the time of day I measure, and the status of my body and posture at the time. And yes, my driver’s license says 5’10”. The horror… alert the DMV! But, what if I told you that most people an inch shorter than me up to an inch taller than me actually vary more than what can be easily explained by sagging arches and compressed vertebrae? Well, not really – but they report they do. That’s right – believe it or not, people lie on the internet. 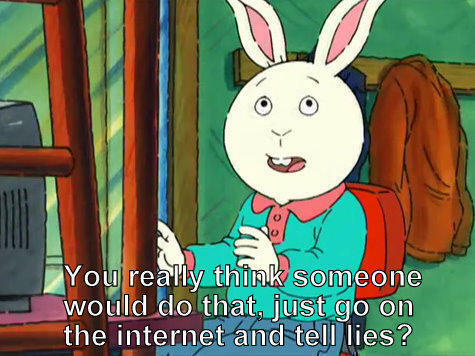 People Tell Lies on the Internet? (higher), investment success (way higher), golf score (lower), weight (lower – unless they lift, then higher). We see that on various websites as well – people lie about the amount of money their site is grossing, the number of page views they get a day, the number of followers they claim, and, well, anything that isn’t easy to verify. One of the most interesting places research has been done on online stat frauding is… surprise, surprise… on online dating sites. When thinking about this article, I came across two excellent studies from the genre, one from the American site OKCupid, and another from the site AYI.com. Their conclusion: males lie about their heights in their online dating profiles… to the tune of about 2 inches. Where Are People Most Likely to Lie? People tend to make small lies – for example, on the order of 1.5%-6% on their heights. Lies increase around important psychological barriers – 6’0″ is a big one for the US… but do you think people who are 1.7272 meters tall claim to be 1.8288 meters tall? Lies are most likely where numbers are hard to verify – or when it’s too late to turn back when they are verified! Author’s Note: Vibram Wedge Soled Boots are good for stat frauding. You’ll see that around any round numbers – everyone makes at least $100,000 a year, everyone 5’8″ to 5’11.9″ is 6’0″ tall, and everyone in the liquor store is 21 years old (tip: don’t say you’re 21.). 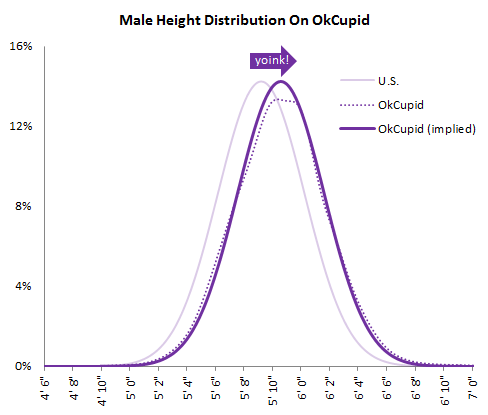 Perhaps that has something to do with the human round number bias – if you think about it, there is a rational basis for this frauding – 6’0″ males do fly through online dating screens easier than our 5’8″ brothers… but 5’10” folks self-reporting as 6’0″ get through the same filter as the legitimate, non-lying 6’0″ person (although who knows – he might be claiming 6’2″). So, yeah – if you’re going to lie, go for the big, hairy audacious one: your favorite author (…me) is 6’8″ and 280 lbs of solid muscle. The Beatles are bigger than Jesus. Richard Nixon is not a crook. And, for the rest of us – if you’re reading something, especially something which contains a beautifully psychologically important round number – it’s very hard to know if we’re observing the truth or somebody rounding up a bit and fudging the almost truth. Fake it until you make it, this is not (well, if you’re over 20 and your growing days are behind you). So, you tell me: what’s your policy on dealing with claims on the internet? Do you use an internet dating service? What would you assume is the actual salary and height of a 6’0″ tall $100,000 earner? Oh, and you’d agree that I was 6’0″ tall… right? It is all too easy to lie on the interwebs. Going to FinCon each year keeps us PF bloggers honest, I like to think. I’d like to eventually attend, but I haven’t been yet – until then I guess things I write are more suspect than most? Sure, where’s there no eyes on it, there’s no honesty, is there? Apart from keeping up a certain measure of obfuscation with regards to personal details (being semi-anonymous and all…), never occurred to “stat fraud” on such things as page views and investment returns on my blog… The traffic numbers are pitiful, and some dividend darlings have turned out to be fat trailer-park slobs…. pero, asi es la vida. I’ve actually got the OKcupid guy’s new book waiting for me to pick up at the library tomorrow – Dataclysm. I would imagine there’s more fudging done on dating site profiles than personal finance blogs, but who knows? I can’t imagine what benefit would be derived from fudging numbers on a pf blog. I wish I had something useful to stat fraud on this here site, haha. But, yeah, if someone is lying on a PF site for a long time… at some point it’s got to feel lie.. “hey, I might as well just put the actual work in”. Please report back on the book, it seems interesting! I believe there is a lack of ‘integrity’, if that truly means “to do the right thing when no one is watching”. I just think it would be funnier to see more people get caught – a la the IRS requiring Social Security numbers for dependents, or execs getting canned when lying on resumes. Height is an easy one to lie about.. between 5’5″ and 5’6″ you can’t really eyeball that. Income is another easy one to lie about to get dates.